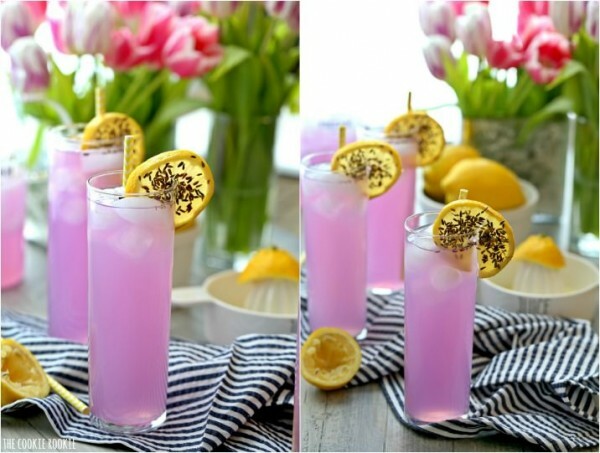 Lavender Lemonade, a fragrant and refreshing drink. Cheers to Spring! Now that I’m doing this blogging thing full-time, I have been frequenting Whole Foods A LOT more. It’s so nice to have time to buy the ingredients I really want, instead of rushing to the grocery store after work and getting whatever is closest! I’m not working with Whole Foods or anything, but that place is the best! It’s seriously my happy place, and I love grocery days spent there! If you’ve been there, then you know that amazing homemade soaps section that smells like heaven. I always stop and take in all the lavender. It might make me want to take a nap, but it smells sooo good! I thought maybe it might be delish in a lemonade. I just need more lavender in my life. Why not? Random, fragrant perfection. Whole Foods sells fresh lavender, but you can also order it on Amazon. You want to be sure you buy lavender meant for eating/cooking, so Whole Foods is an easy way to make sure you’re getting the best kind. Again, not working with them, but they’re such a great spot. They make eating and drinking fun, delicious, and fresh foods so easy! Click HERE to see the original post, photos, and full recipe on The Cookie Rookie! The post Lavender Lemonade appeared first on The Cookie Rookie.